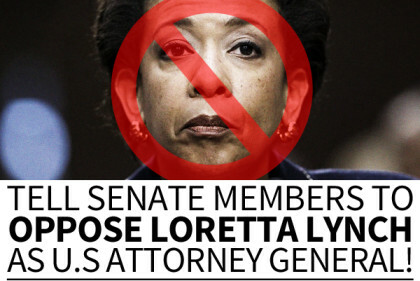 "Tell Senators: Oppose the Confirmation of Loretta Lynch as AG"
Loretta Lynch, Obama's pick for Attorney General, is an enemy of the Constitution and must not be confirmed by the U.S. Senate. Loretta Lynch was confirmed as U.S. Attorney General on Thursday, April 23, 2015. Loretta Lynch, Obama’s pick for Attorney General, is an enemy of the Constitution and must not be confirmed by the U.S. Senate. After several years of Eric Holder, it’s high time for the U.S. Senate to stand firm and place a man or woman of honor in the U.S. Office of the Attorney General. Before the vote on Lynch takes place, make your voice heard and contact each of your U.S. Senators and demand them to oppose the confirmation of Loretta Lynch as U.S. Attorney General. Add your name below and send your messages now. Caroline S. from Westland, MI signed. Loretta Lynch is an enemy of the Constituion and must not be confirmed by the U.S Senate. Danny G. from New Smyrna Beach, FL signed. Margery T. from Lancaster, WI signed. Kurt N. from Lumberton, NJ signed. Brenda D. from Lake Havasu City, AZ signed. Vernetta M. from Billings, MT signed.